Bridge House Stud is a small family run farm owned by the Badger family. Supported by state of the art facilities and excellent equine husbandry and care, stock are produced in a natural and caring environment laying the foundations for their future success. We have many years of expertise in achieving the maximum breeding potential of broodmares based on knowledge gained in some of the worlds most highly regarded stud farms in Australia, New Zealand and France. Mares foals and young stock are assessed daily with condition scoring and growth rates continually monitored. Trevor's qualification in Orthopaedic Farriery from the National Stud in France ensures that leg alignment is prioritised. Mark Fagan MVB, one of Ireland’s leading equine fertility and sales panel vets, has given us round the clock veterinary support for over 20 years. 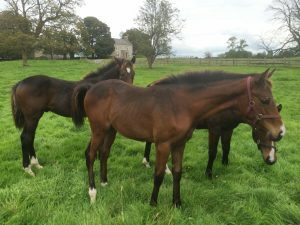 Our mares are foaled under the expertise of Michael Ronayne at Ballyhast House Stud who ensures that mares and foals will be monitored 24 hours a day and receive the very best start in life. We have a reputation for sympathetically breaking and bringing on young horses while allowing them to maintain their personalities and character. The Westmeath network of exceptional training resources - spas, swimming pools, uphill gallops - are on our doorstep and we are pleased to offer Sales Preparation, Breaking and Pre-Training, Recuperation / Winter Resting, In-house Orthopaedic and Remedial Farriery.